There was once a time that combat flight sims dominated the skies in virtual space. 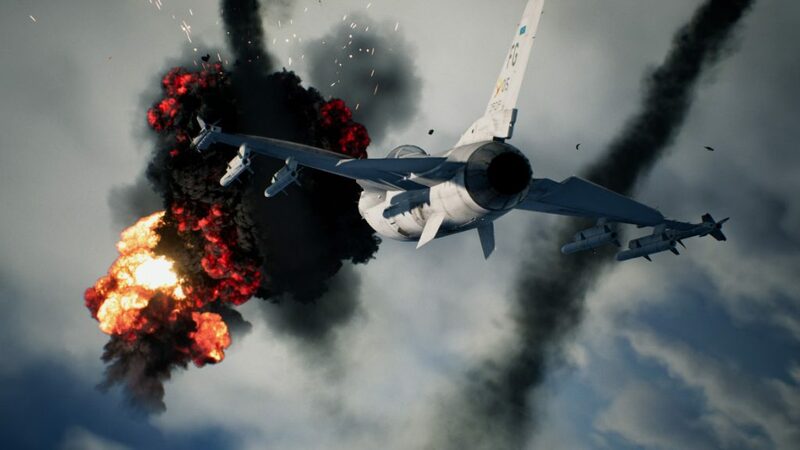 The popular genre has in recent times gone under the radar, but Ace Combat 7: Unknown Skies is about to take you back in time where planes ruled the skies and the space in your living room… as this is easily one of the best entries into the series. Ace Combat 7: Unknown Skies kicks off after events that took place in Ace Combat 5: The Unsung War on the PS2. Forget about those so-so entries in the last generation, as this is a complete return to form. 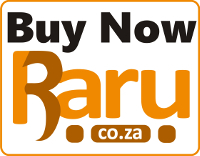 As has become very popular with earlier entries, there is a story attached to your campaign. Yes, it’s your typical over-the-top and cheesy Japanese dialogue and laughable cut scenes, but it fits the setting so well. The fictional universe of the previous titles return and the skies are once again not safe on the Usean continent. The military power of Erusea and the former president, President Vincent Harling, bump heads and you are stuck in the middle of everything. 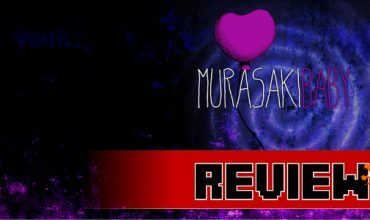 The story, believe it or not, is actually quite interesting and gains enough momentum to keep you playing right until the credits roll. Bandai Namco has taken the time to include both rookie and veteran plane controls. The player that grew up with older combat flight sim games will feel right at home with the advanced controls where you get to pitch and roll a plane as you would in the real world, while the rookie setup has a much simpler control method attached to it for those who have difficulty coming to grips with the advanced controls. The first mission is your obvious tutorial, but the developers don’t hold your hand for long. From the second mission onwards you’ll have to come to grips with the mechanics real quick as the difficulty spike ramps up rather quickly. Where in the first mission you’re tasked to shoot down a few bogeys, you’re later dumped into a time-limited mission that requires you to destroy radar systems on the ground, which is surrounded by an enemy defence system that includes anti-aircraft guns (AA Guns) as well as threats from the sky. Very early on you have to learn how to fly close to the ground and at the same time gain altitude to take out other foes. 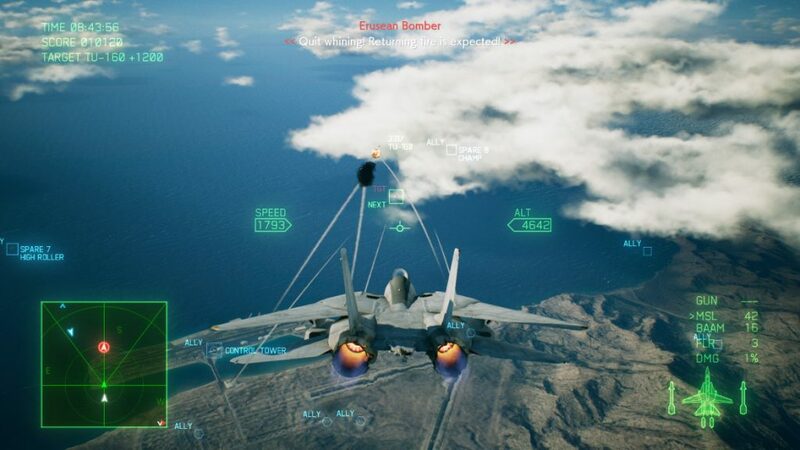 While doing this you constantly have your eyes on the clock, focussing on veering off incoming missiles, checking your radar and swapping between marked enemies – both ground or sky. So, expect to plummet into the ground a few times. It’s hectic, and that’s just the beginning. What works so incredibly well for Ace Combat 7: Skies Unknown is the mission structure. 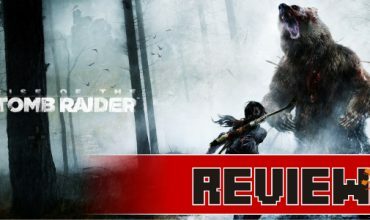 Unlike so many other games that dip their toes in the open-world environment, the developers dropped that idea and returned to what made it so very popular in the mid-2000s. One mission you’ll have a limited time to reach a particular score and the next you’re escorting a plane to its destination. You always feel like you have this super important task, thanks to all the dialogue that constantly takes place over the radio. 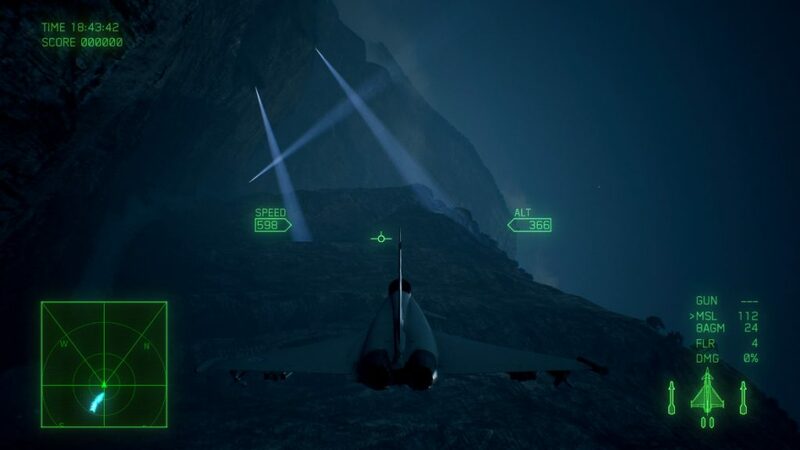 Players will also experience objectives where they have to avoid enemy radar, fly through lightning storms that affect the electronics on the plane, carefully make your way through a mountain range below a specific altitude while dodging search lights to surprise the enemy base and more. These missions are so much fun to play, but the real heroes are the planes and this time they’ve been super-sized. I feel the need, the need for… upgrades? After any briefing, it’s a good idea to visit the Aircraft Tree. Here you’ll buy new planes as well as important upgrades. 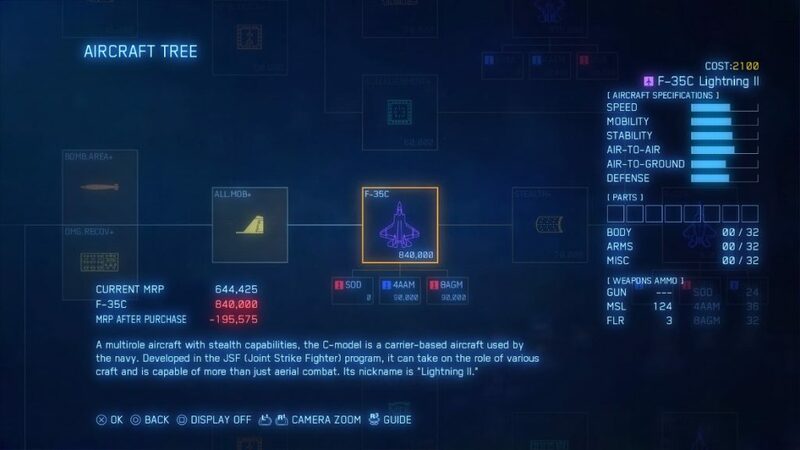 Each plane is unique and comes with its own set of stats that include speed, mobility, stability, air-to-air, air-to-ground and defence stats. What makes it all very interesting is that you get to decide what path you will take and, depending on the type of player you are, it’s important that make you make the right decisions. One branch might see you end up with the F-35C that has great stealth capabilities, while another path will see you purchase the lightning fast F-15E. Each plane also comes with its own set number of missiles, flares and unique special weapons. That special weapon can be the difference of cruising through a mission or making the task very difficult for yourself. Be sure to listen to those briefings in detail. This doesn’t mean these stats are set in stone. There are upgrades that’ll affect your basic stats and standard onboard weaponry. For example, buying the MSL.RELOAD+ will drop the reload time of your missiles once you shoot it off and the ICING.DEF+ will prevent your aircraft from icing up as much as it normally does if you reach altitudes that are too high or if you’re stuck in clouds. The small upgrades make your experience that much more enjoyable, so choose wisely. 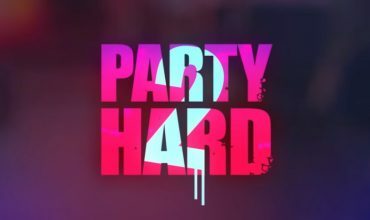 Once you’re done with the campaign it’s time to visit the online multiplayer mode – it’s here where the men are separated from the boys. The pilots who know what they are doing are ruthless, so it’s best you upgrade your aircraft set with parts you either bought or opened in the campaign. Your aim is to basically max out the body, arms and miscellaneous (such as anti-icing and defence) of any particular aircraft you choose. As with a loadout in a first-person shooter, you can save various aircraft sets. Players are levelled up in rank and, should you bring down a higher ranked pilot, you’ll gain more MRP to spend on upgrades and the MRP you are awarded with in multiplayer is huge. Risk equals reward. Ace Combat 7: Skies Unknown is a beautiful game on the PS4 Pro that runs at a crisp 60 fps. The small details, such as flying through clouds and seeing the drops of water form and turn into ice in real-time brings a sense of realism. The aircrafts are all very detailed, though some of the surroundings aren’t quite as polished. Fly close to some buildings and trees at a slow speed and it’ll leave much to be desired. The biggest disappointment is most definitely the lack of HDR. It’s a game that would have benefited from it greatly. Luckily it still looks striking without it. However, if you’re the proud owner of a VR headset there is an ‘out-of-this-world’ experience waiting for you. There are only three missions in total, but once you complete them you’ll wish there were more. I found it much easier to follow my target in VR. Instead of following the on-screen arrow, you just simply look in the direction you need to fly and adjust your speed and angle accordingly. For most players this is as close as you’ll get to flying a real plane and seeing the HUD details on your dashboard is just something else. The small upgrades make your experience that much more enjoyable, so choose wisely. I was fortunate enough to play the game using both the Dualshock 4 controller (which works better than you might think) as well as the Thrustmaster T-Flight Hotas 4. The flight stick is arguably the more precise and easier method to steer your plane, and in VR it takes the immersion to a whole new level, but there is one particular bit where it really excels – the precise throttle. On the Dualshock you’re constantly adjusting your speed with R2 and L2 (to speed up or slow down). Let go of either trigger and the speed will automatically reach a neutral number. On the T-Flight Hotas 4 you can maintain your plane at a certain speed without having to constantly adjust it, which aids you in dogfights in a big way. Also, pressing down on both thumbsticks (L3 and R3) to set off flares when you’re in a stressful battle is a bit cumbersome and can be done with a simple press of a button on the stick. In other words, if you’re serious about combat flight sims, then I highly recommend you consider it to enhance your experience. 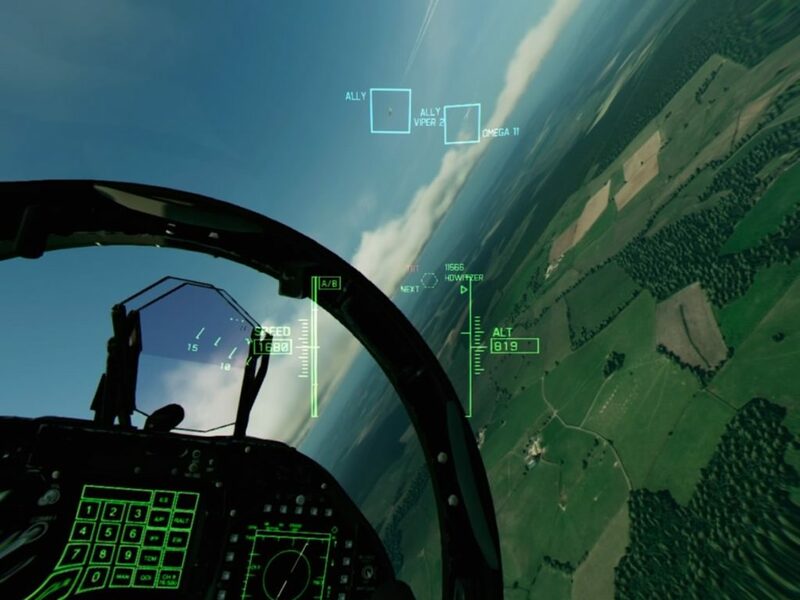 It’s wonderful to see a traditional combat flight sim returning to the fold. Bandai Namco revisited what worked and brought with it a tough but challenging campaign and multiplayer component. Fans of the series will rejoice and newcomers will get to fly the unknown skies. Ace Combat has returned and locked on to all who enjoy a great aircraft adventure. The longstanding series had stalled in recent times, but thankfully its back on track to be one of the best combat flight sims that money can buy. Whether you're after a lengthy campaign or a challenging dogfight online, there is something here for every person who dreamed of piloting a fighter jet.